I guessed the theme from the title which isn’t really what I’m hoping for in a Thursday grid. But still, the entries aren’t bad. The revealer is TICS at 63a [Idiosyncracies added to this puzzle’s longest answers]. 17a [Morning glories on a trellis, say?] LATTICE BLOOMERS. Late bloomers. 26a [Indication of a booby-trapped Big Mac?] BURGER TICKING. Burger King. Best entry. I picture Bugs Bunny slipping a bomb into Yosemite Sam’s meal. 44a [Result of dipping your quill into honey?] STICKY WRITING. Skywriting. 57a [Shot to prevent illness spread by shaking hands and kissing babies?] POLITICO VACCINE. Polio vaccine. I like this one, too. “Polio” becoming POLITICO was surprising. Fave fun fill: EMOTICON, MAKE NICE, and ART STUDENT. Also good: TRILOGY, NEMESIS, DIARIES, and NOMINATIVE. MORAN [Capone rival]. My knowledge of early gangsters doesn’t go beyond Capone and Bugsy Siegel. Many of George “Bugs” MORAN‘s gang members were killed in the St. Valentine’s Day massacre by Capone’s men. MORAN‘s gang never regained their stature and eventually MORAN left Chicago. 14a [Pop drop, e.g.]. ERROR. Not sure what the clue is referring to. Anyone? Other clues I wasn’t familiar with: [Starchy] for PRIM, [Melodramatic] for SUDSY, and [Black Watch topper] for TAM. Not from Game of Thrones, the Black Watch is an infantry battalion of the Royal Regiment of Scotland. 42a [Goodman specialty]. SWING. Benny Goodman, of course. Although John Goodman may participate in swinging for all I know. 49a [Ozzy’s wife]. Not Harriet, but SHARON Osbourne. 9d [Type face?]. EMOTICON. 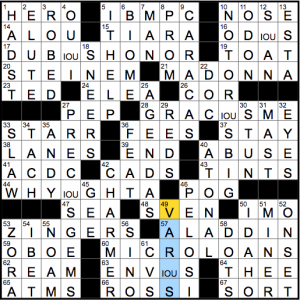 Best clue in the grid, followed by 19d [Pen chant] for OINK. A pretty straightforward theme for a Thursday (alas), but a good grid nonetheless. 3.4 stars. What a treat! Patrick’s puzzle has Orca written all over it (figuratively speaking). This is one my favorite puzzles ever. I knew there was a rebus pretty early, because I had SHAME at 1a and that made HAMLIN the logical choice for 2d’s [“L.A. Law” actor]. The rebus showed up at 18a [Exactly the stated amount], and I decoded it as NO MORE NO LESS. Aha! The title must mean there are two answers (“and”) which can substitute for each other (“or”). Clever! I found the next one at 59a [Discussing at tedious length]. I looked at GO ON IA NG GO OU NT and thought it was GOING ON ABOUT, but that doesn’t work. Turns out it’s GOING ON ON ABOUT. Huh? Oh! That’s GOING ON AND ON ABOUT with the AND missing. So I looked back at 18a and realized it was actually NO MORE AND NO LESS. More clever! The third rebus appeared at 89a [Fairy tale featuring a gingerbread house]; when I added the AND to the letters I found, it turned into HANSEL AND GRETEL. Fun! I finished the puzzle and didn’t get Mr. Happy Pencil because Black Ink (the software I use to solve .puz files) doesn’t like rebuses. I confidently took my screen shot for this writeup and checked the solution to make sure I didn’t have any typos. I didn’t – but 79a showed up as incorrect. 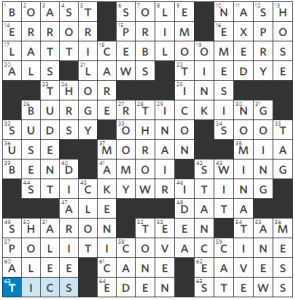 It’s [Question posed to a team captain] and I’d filled in TAILS because I had the T from 62d [Characterized by longing] – WISTFUL. Except….WISHFUL also works. Sure enough, HEADS fits all the crosses as well. And I realized that the [Question posed to a team captain] is actually HEADS OR TAILS? Further investigation found two more: I’d filled in TRICK for 24a [Cry while in costume], and TREAT also works because it’s TRICK OR TREAT, of course. And then there’s 45a [Ultimatum given to derelicts], which I’d answered as SHAPE UP. I looked again and realized that the phrase is SHAPE UP OR SHIP OUT and, sure enough, the crossings work. So now we have a rebus puzzle with missing ANDs and a Schrödinger puzzle with missing ORs. Wow. Wow. Wow. See why I mentioned the Orca awards up top? Ladies and gentlemen, Patrick Berry. We are not worthy. Here is my grid and the grid that Peter sent out. Mine has clue numbers; the rebuses are much more legible on his. Don’t mind me; I’m just going to stare in amazement at this grid for a while longer. I also don’t usually give stars, but for this puzzle….five. It’s Thursday, and power duo Jeff Chen and Mary Lou Guizzo have a special… offering for us. Get it? Offering? 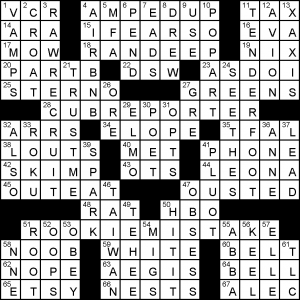 16a, OD(IOU)S [Repulsive], crossing 12d, S(IOU)AN [Winnebago, for one]. 17a, DUB(IOU)S HONOR [Making a “Top Party Schools” list, e.g. ], crossing 4d, OU(I OU)I [“Certainement!”]. 28a, “GRAC(IOU)S ME!” [“Heavens to Betsy!”], crossing 10d, NOTOR(IOU)S B.I.G. [Noted artist on Bad Boy Records, with “the”]. 44a, “WHY (I OU)GHTA…” [Catchphrase for Moe Howard], crossing 35d, PREC(IOU)S GEMS [Contents of a treasure chest]. 63a, ENV(IOU)S [Going green? ], crossing 49d, VAR(IOU)S [Sundry]. AC/DC gets the tricky clue [Choice of juice? ], and LANES sitting right on top of it gets another “?” clue, [Strike zones?]. A hyper-current clue for 57a, ALADDIN [Hit 1992 film with a 2019 live-action remake]. Will Smith has been cast as Genie; even with his comedic chops, he’s got big shoes to fill. Nancy PELOSI [House speaker after Hastert] has been much in the news lately–now that the Democrats have a majority in the House, there’s much speculation about whether Pelosi will be able to corral the necessary votes to become Speaker once again. Since I’m running late tonight, I’ll go ahead and stop there. Fun stuff! Until next time! 59D: Started cries removed from this puzzle’s theme — OHS. Grokking the theme here took me a sec, so it was nice to have the two-part revealer explain that an OH is missing from each theme entry. We’ve got TWO HIT WONDER, HIGHWAY TO HELL, MAX BEERBOHM, and COLUMBUS OHIO. I don’t like the use of the IO moth here, since that feels a little more obscure than the moon of Jupiter, but YMMV. 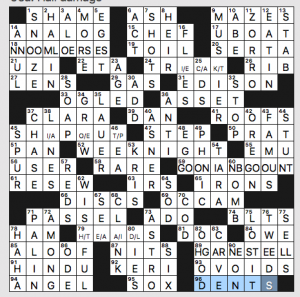 The rest of the puzzle is pretty solid – I liked WADDED UP, TESSERA, and SOURWOOD amongst the downs. This is a loose, and rather unusually presented grid and theme today from Zhouqin “C.C.” Burnikel. It has left-right only symmetry to accommodate irregular theme lengths. Many of the theme entries are also quite short. Each describes a specific variety of TYRO – a RAWRECRUIT is associated with the military; TENDERFOOT is linked here to the Scouts – I didn’t know that but Google suggested it is historically true; CUBREPORTER covers the media; a WHITE/BELT is split over two parts and is associated with martial arts; lastly, a NOOB is associated with online gaming (I’d been reading this as gambling till now, gaming makes way more sense). Above this last line is the revealer: ROOKIEMISTAKE, of which only the ROOKIE part really applies. GREENS is not thematic though, at least I don’t think so – It isn’t asterisked nor clued thematically. Lively entries make up for the comparatively loosely defined theme. This entry was posted in Daily Puzzles and tagged Brendan Emmett Quigley, C.C. Burnikel, Ethan Erickson, Jeff Chen, Mary Lou Guizzo, Mike Shenk, Patrick Berry. Bookmark the permalink. The Fireball puzzle should be in a crossword museum. Agreed. The thing was indeed impressive. I missed the “OR” part of the gimmick, having parts of the words in there to make words of the phrases. It was kinda dumbly, as I had questions between letters on several of the squares, and I noticed after the fact that I missed (wrongly read I guess?) 24A and 79A, which pretty handily revealed that part of the gimmick. I’ll add to that and say the whole thing was good to work, wasn’t boring, and didn’t turn into a slog over the time I worked on it. Again (3rd or 4th time said now? 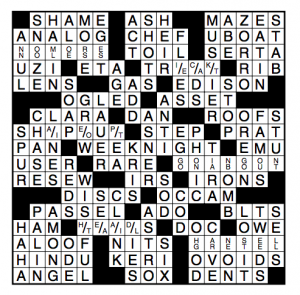 ), a puzzle that definitely belongs in a “Hall of Fame” pile. Impressive, but the undoubled letters in the OR phrases were annoying and the catch phrase is no more, no less the way I’ve always hears it. No and. Wow. Just wow. Even though I agree that, “No more, no less” is far more common than “No more and no less.” Definitely an Orca candidate. WSJ: I assume Pop drop = ERROR is referring to baseball (dropping a pop fly). WSJ: Ozzie and SHARON meant nothing to me, making HOLI really tough, but the only first name I could come up with seemed to need the H, so I guess OK. As new words go, NOMINATIVE is interesting, even if I’ll be challenged to fine a use for it. No comment on elute. 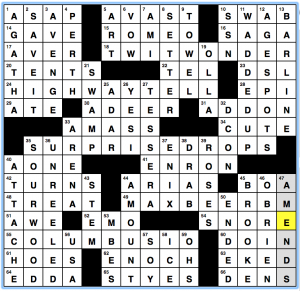 Pure crossword-ese. Good science or not. BEQ: Spent way too much time trying to figure out all of the other theme entries after I found TWIT(ter)WONDER. See, the ‘ter’ drops (surprise!) from the fill, so I was looking for the same mechanism for the rest of the themers. Sigh. Nice misdirection, whether purposeful of not (knowing BEQ, it wasn’t an accident). Patrick Berry’s Fireball was awesome.